Go…. read the whole thing….now! 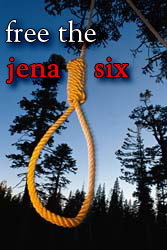 Remember the Jena Six? It seems not many do…. In September 2006, black students at Jena High School in Jena, Louisiana, jokingly asked permission to sit under a tree in the schoolyard that by tradition, only white students sat under. The principal told the students they could sit wherever they liked; soon after, black students sat under the tree. Shortly after this, three nooses (in the school colors) were hung from the tree. Anyone remotely familiar with the history of the lynching of black people in this country would recognize such an action as a threat. Although the recommended punishment for the white students who were found to have hung the nooses was expulsion, the culprits received an only in-school detention, and the incident was dismissed as a prank. For the rest of the fall, there was heightened tension between black and white students at the school. After a number of incidents (including arson), six black students fought with a white student and five were charged, as adults, with attempted murder (a 14 year old was charged as a juvenile, the others were 16 and 17 at the time). One of the young men, Mychal Bell, was jailed for over a year. On September 20, 2007, thousands of protesters descended upon Jena in support of the Jena 6. Mychal Bell was found guilty and convicted of aggravated second degree-battery and conspiracy to commit aggravated second-degree battery. Such a charge requires the use of a “dangerous weapon” – the prosecutor argued Bell’s tennis shoes constituted such an item. Again, Bell was charged with this crime as an adult and with a conviction faced 22 years in prison. The conspiracy conviction was eventually vacated, on the grounds that Bell should have been tried as a juvenile, and the battery conviction was also overturned on the same grounds by the Louisiana Third Circuit Court of Appeals. Bell was eventually sentenced to 18 months in a juvenile facility on two counts of simple battery and two counts of criminal destruction of property, charges never even mentioned during the original proceedings. Bell eventually plead guilty to a reduced charge of battery and was sentenced to 18 months in a juvenile facility. Thousands attended a rally in Jena on September 20, 2007, the date scheduled for Bell’s sentencing. Rallies were held all over the country and there was a groundswell of attention given to the issue of unfair treatment by the criminal justice system, especially to youth of color. Where has that attention gone? The mainstream media was slow, very slow to give attention to the Jena Six case. Brought to light by bloggers, particularly bloggers of color, MSM eventually jumped on the bandwagon. The remaining cases have not yet been resolved and activism around the issues have died down. Sylvia blogs about the overall movement, and its lack of a general perspective on the purposes of looking at these cases. This work is important. Documenting the cases and telling the stories of what happens to youth – particularly those of color, and/or those who are queer and/or those who are poor – because of an unjust justice system cannot die down because of America’s short attention span and long legacy of oppressive structures, policies and practices. Keep remembering and keep telling. She then lists all the women who have run (and who are currently running) for POTUS. ETA – here is the new URL for that post.